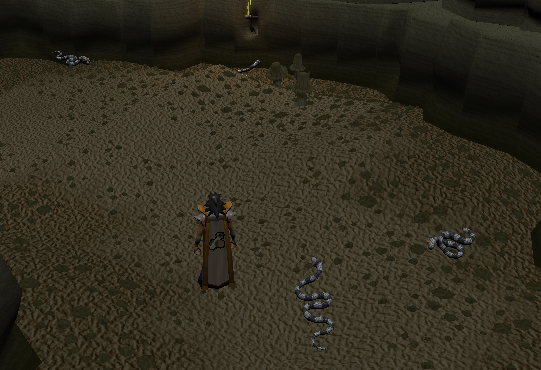 To enter the caves underneath the Kingdoms of Miscellania and Etceteria, you must have first started Royal Trouble. Along with linking the two rival islands, they offer a small town and areas that are a key location for the Royal Trouble quest. 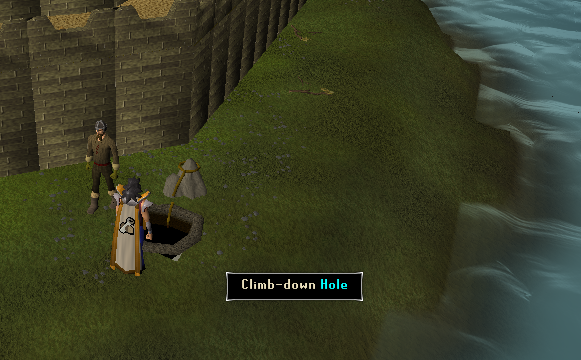 There are two entrances to the caves. 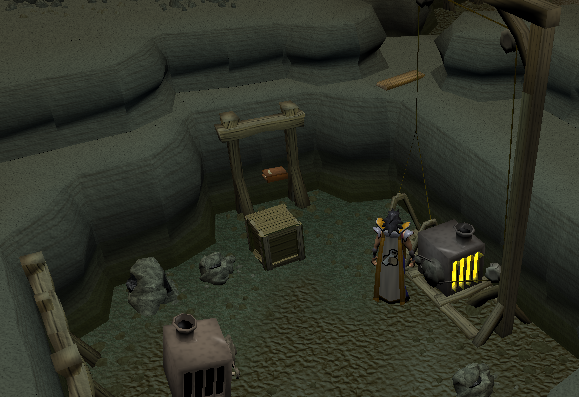 The first can be found in the southern part of Miscellania, just next to the castle and within the city walls. Upon entering, you'll see a small market. 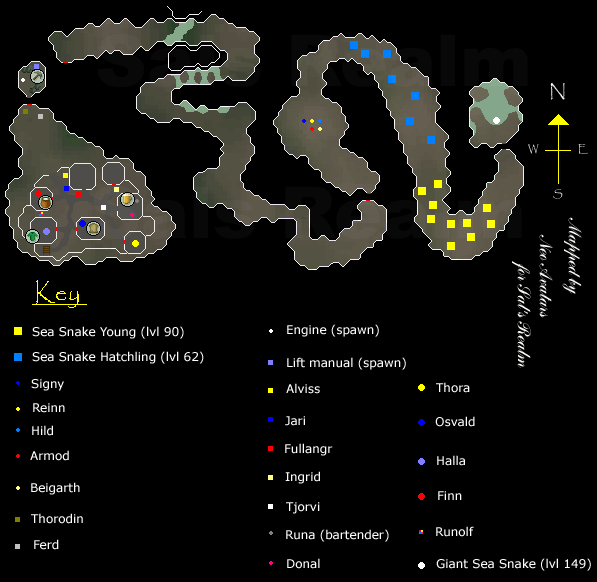 This includes many stores that the above-ground portion of Miscellania doesn't. There are four stores in total, including a clothing shop, general store, grocery store, and a bar. The clothing store sells a mix of both Dwarven and Fremennik clothes. Then there's a General store. This is just like any other general store. The food store is useful for getting many ingredients, including the ingredients for making a Cake. Unlike most bars, this bar sells tea, cider, and wine. Donal is also in here. He is involved in the Royal Trouble quest. 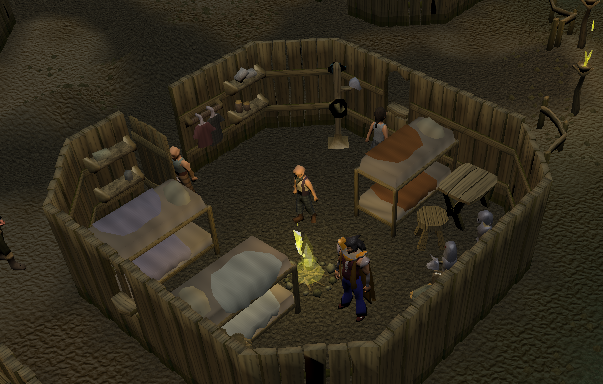 As this is a dwarven inn, there are dwarves inside. In the northern part of the city, there is a crack in the wall through which you can climb. You'll need a stabilizer to get in the small area. In the crate closest to the bottom of the picture, there is a beam to make your pulley beam longer, and to make other parts of your lift platform. In the crate one square north of the crate with the beam is a pulley beam. Two squares north of the pulley beam crate is an engine respawn. You need this to power the lift platform. To feed the engine, you must put 5 Coal in the engine. 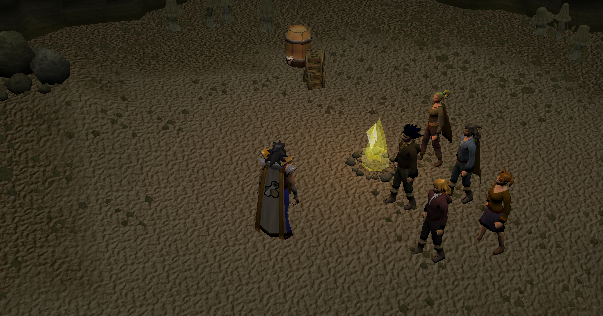 There are four coal rocks in the area. 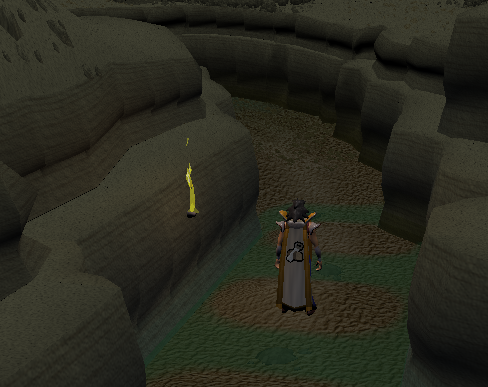 If you forgot a pickaxe, you can take one from the Bronze Pickaxe respawn south of the crack in the wall. The most northern respawn is a book sitting on top of a crate. It will tell you how to fix the lift platform. Inside the crate the book is sitting on is some rope. When the lift platform is fixed, it should look like the one in the picture. Once you get lifted by the platform, you'll be on top of a huge rock. To get down to the cave, squeeze through the crack in the wall. Now follow the walkway and you'll find a rope. The rope shown in the picture doesn't initially exist. 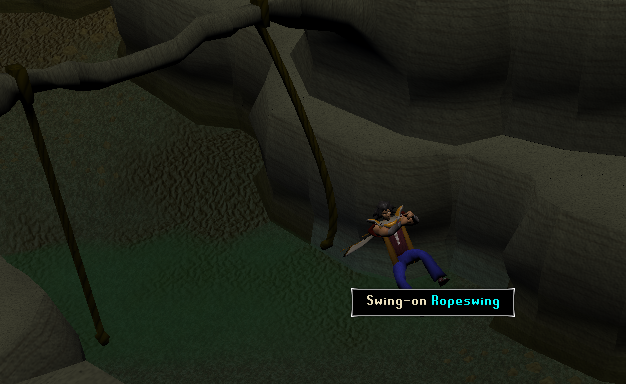 You will have to add a rope to the rock to be able to swing across. Note: From this point on, there will be fire remains you can search to get one of the teenager's diary. You can only get it if you don't have the diary already. To avoid the slippery rocks, you can use a plank on each one to cross them safely. If you don't have a plank, you might slip and get hit. There is a plank respawn near the crack in the wall at the entrance of the tunnel. If you walk directly over the steam vents, you'll take rapid damage. The hits are high, so never stand on a vent unless you have a death wish. They can reduce your Lifepoints by 450 in around 4 seconds, so watch out! You can avoid the vents by walking around them. 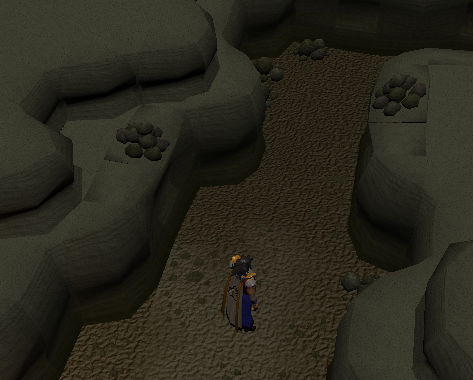 The rocks shown in the below picture (those positioned on the ledge) will fall and damage you if you step in the squares directly adjacent to them. 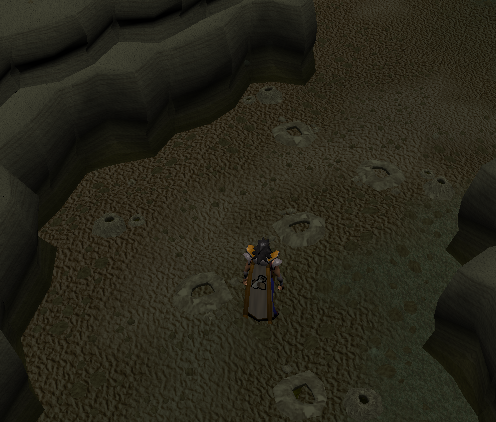 Keep one square between yourself and the cavern walls at these points. The teenagers (Signy, Reinn, Hild, Armod, and Beigarth) are important characters in the Royal Trouble Quest. To get to them, squeeze through the crack in the wall and continue down the path. If this is the first time you've been through that crack, you will see a cut scene. 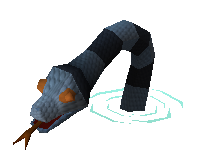 There are two types of sea snakes: Sea Snake Hatchlings (level 62) and Sea Snake Young (level 90). They are very similar in appearance, the only difference being their sizes. This is the other exit, and can be found just east of the Ecteterian Castle. 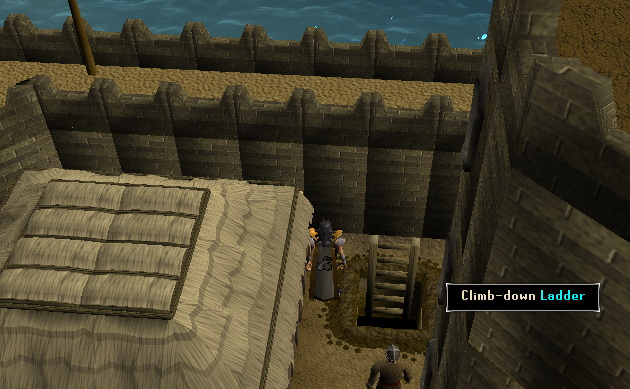 It is only accessible after you have killed the Giant Sea Snake.